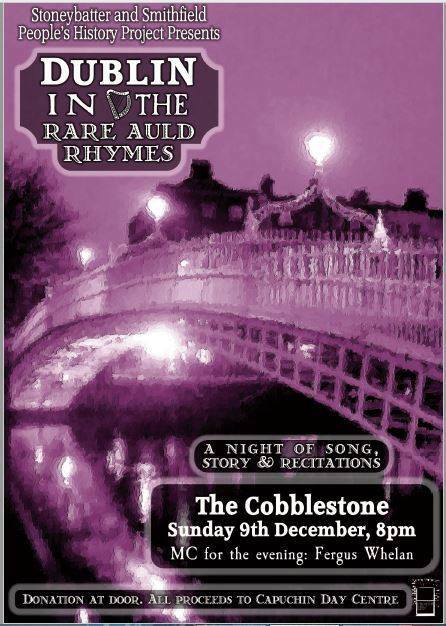 Great night of Songs, Stories & Recitations for the annual Dublin in the Rare Auld Rhymes with a host of Cobblestone furniture owners and Guests. All in Aid of Bro. Kevin Crowley and the Capuchin Day Centre who feed the needy of Dublin’s Fair City in these harshest of times. Presented by Stoneybatter and Smithfield People’s History Project with MC Fergus Whelan.